You officially have a month until Christmas – so it’s time to get out there and start shopping. And of course, this Friday is one of the biggest shopping days of the year… Black Friday. 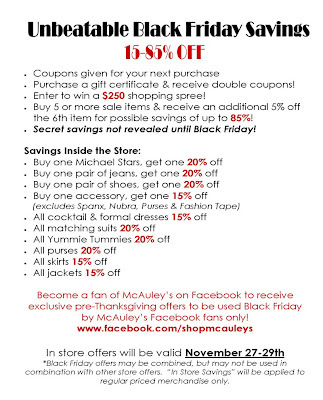 What better place to start your shopping frenzy than McAuley’s Unique Boutique who is offering 15 to 85% off, sunrise to sunset, on Friday, Nov. 27 – 6 a.m. to 8 p.m.
Plus, McAuley’s Unique Boutique has a few secret savings that won’t be revealed until Friday! If you haven’t found your gameday outfit for the Clemson vs. USC game this weekend, you need to get yourself to McAuley’s Unique Boutique – a lot of their orange and purple gameday apparel prices will be marked down this weekend as well. And don’t forget to become a fan of McAuley’s Unique Boutique on Facebook – all Facebook fans will receive a special coupon just for them tonight that can be used in store or on their Web site Friday – Sunday. This is awesome for girls like me who won’t be in the upstate this weekend – I can still shop McAuley’s awesome looks this weekend, use my Facebook coupon…while in my pajamas and eating leftover turkey. Are those Tiger Striped tights above?!?! Perfect for your gameday outfit! Love! This skirt above is amazing! Definitely a work to night out piece for our wardrobe. Love this look above! Looks comfortable, yet super trendy. So make sure you stop by McAuley’s Unique Boutique while you are shopping this weekend – click here for a map. If you have any questions about the sale or any of the looks in this post, you can contact McAuley’s Unique Boutique by email, customerservice@shopmcauleys.com , or by phone, 864-226-7773. I know I’ve said this a million times, but the thing I love about McAuley’s is that you can get a complete look – an entire outfit – from their store. And if you’re not fashion savvy, you don’t have to worry – their staff acts as your personal stylists while you shop. Stay tuned to Facebook – the special coupon will be sent to fans tonight! Happy shopping Clemson Girls!